“The Honey Jar” is the first book introducing restaurant owner, wine connoisseur and cryptoglogist Fredric Drum. A reserved personality with a good dose of self-irony- an outsider and explorer. Drum is in Bordeaux to fill up his restaurant´s wine cellar. On the very first day, he falls into a deep hole in the ground far away from people. Miraculously he finds his way out, and literally dumps straight into a terrifying mystery in the small village St Emilion, where he does not recognize that he actually plays a starring role. Seven people have disappeared without a trace from the village within short time and the village is in crisis. Drum eventually discovers someone wants to kill him. But why? What does he know? Why is he a threat? Which links may he have to the seven missing people in the city? There are many questions, and the reader wonders together with Drum. What on earth is the connection? Parallelly, Drum is puzzled by unsolved riddles from the ancient Minoic culture- linear B…. 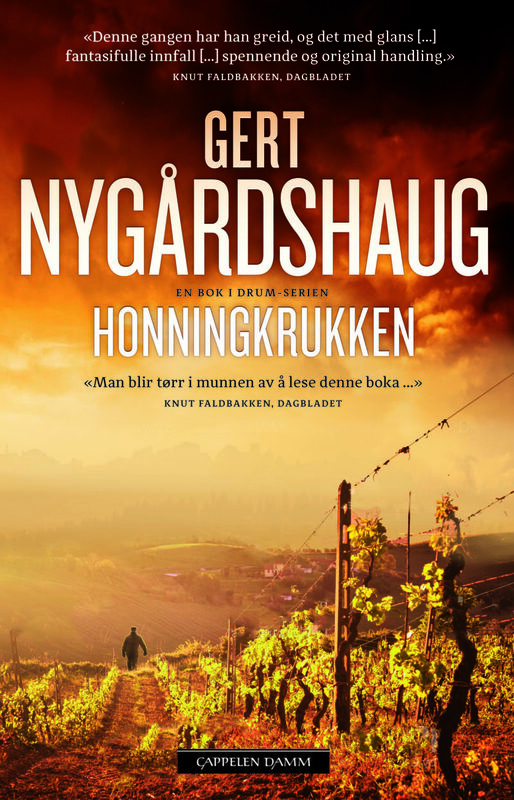 Nygårdshaug´s knowledge and imaginative whims developes into a tight, logical and above all exciting and original crime novel! No wonder it was chosen among the candidates to the Aschehoug award!